We specialise in all Brisbane backflow prevention devices and thermostatic mixing valves. Testing, repairs and installations with the best price, service and advice! Our team of backflow testing Brisbane experts hold open plumbing licences with a special endorsements for testing, repairing and installing backflow prevention devices. We are experienced in maintaining and servicing backflow devices. We have access to diagrams for every make and model of RPZ valve, dual check valve and vacuum breaker valve on the market. Here at Conrad Martens Plumbing, our licenced backflow specialists regularly test, repair and replace backflow prevention devices. If you need your backflow device checked or repaired, give our team a call. Backflow prevention devices are used to safeguard the mains water supply against harmful contaminants. These devices include Dual Check Valves (aka Double Check Valves), Single Check Valves, Vacuum Breaker Valves and Reduced Pressure Zone Devices (aka RPZ valves). Backflow can occur when the water pressure in the mains water supply is lower than the pipework in your property. This can create a vacuum in the water main that results in back siphonage. If your property’s water supply is somehow connected with a source of contaminants, this can potentially be drawn into the water main. Contaminants may be from things like cross connections, hoses sitting in liquids, irrigation systems etc. If this happens, backflow devices will prevent the reverse flow of water into the drinking water supply. How often do backflow prevention devices need testing? Backflow prevention devices, need to be tested annually to make sure they are operating correctly. This testing every 12 months is enforced by councils and state legislation in Queensland to safeguard against contaminated sources entering the water supply. 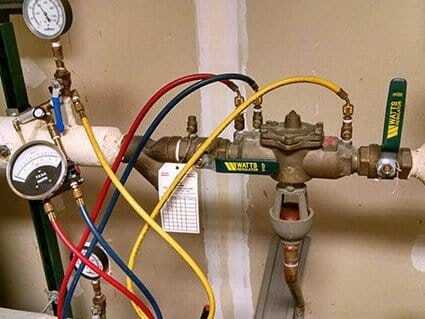 The device/s must be inspected by a licensed plumbing contractor who has Backflow Prevention endorsements. A test report is then issued directly to your council to certify the device/s have been tested and certified. We offer backflow prevention testing promotional rates for new customers and discounts for properties with multiple devices. All our clients are scheduled for automatic annual reminders to ensure devices remain compliant. 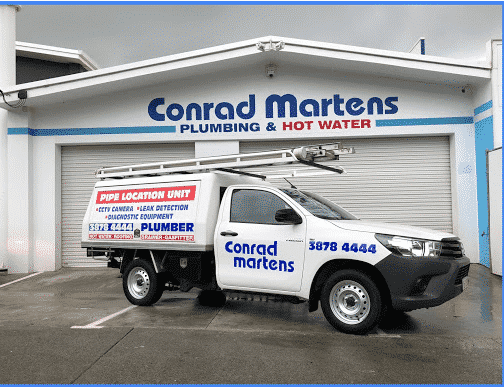 Through our competitive pricing and no fuss scheduled testing, Conrad Martens Plumbing currently service over 300 testable backflow prevention devices across Brisbane. For more information, or for a free backflow testing quote, call our friendly team on 3878 4444. Our team hold open plumbing licences with a special endorsements for testing, repairing and installing TMV devices. What is a TMV Thermostatic Mixing Valve? Thermostatic mixing valves precisely mix hot and cold water to a preselected temperature. This ensures the delivery of hot water at the preselected temperature to an outlet. TMV’s are primarily installed in health care facilities, hospitals and nursing homes to prevent scalding. The valves operate using a thermostatic element and sensor which responds to changes in the temperature of the incoming hot and cold water. When setting the temperature, the distance from the valve to the outlet is taken into consideration to make up for any temperature loss. Why do TMV’s need testing? In order to safeguard against a valve failure, thermostatic mixing valves include a thermal shutdown component. This component then prevents scalding in the event of a valve failure. To reduce the possibility of failure during operation, these valves require servicing on a regular basis. We can implement a regular servicing schedule and submit a commissioning/maintenance reports upon completion. Our accredited licensed plumbers also provide a full maintenance and replacement service for all types of Thermostatic Mixing Valves. If you need your TMV checked or repaired, give our backflow testing Brisbane team a call.